It’s the third day of CNY and we are having lunch at Indian Kitchen. Earlier, D.F called Shiva to let him know that we are coming and did an “omakase” on him. *Omakase is a Japanese phrase that means “It’s up to you”. To start us off, Shiva serves us with some clear vegetable soup. 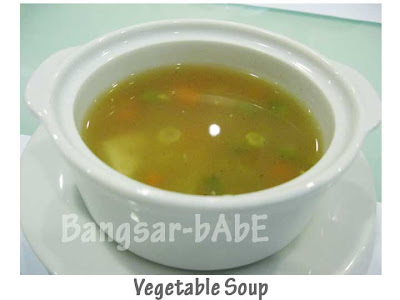 The soup is lightly spiced and the vegetable chunks are soft, not mushy. I prefer hearty, creamy soups so this is just okay for me. 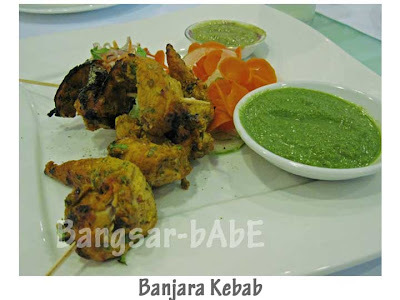 The Banjara Kebab is well-seasoned and tender. Served with tangy mint sauce, it makes a decent dish, but Shum and I like the Chicken Amritsari (previous visit) better. 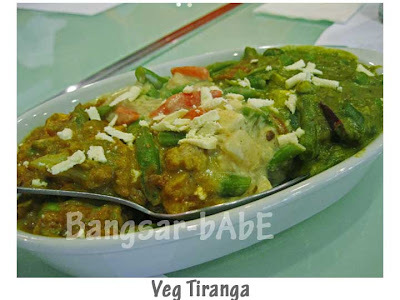 Topped with grated cheese, the Veg Tiranga consists of three different gravies – kurma (cashew nut), spinach and chili (mixed vege) base. The cashew nut gravy is mild, the spinach gravy is slightly spicy and the mixed vege gravy is perfect for those with a fiery palate. I like the mixed vege gravy best! 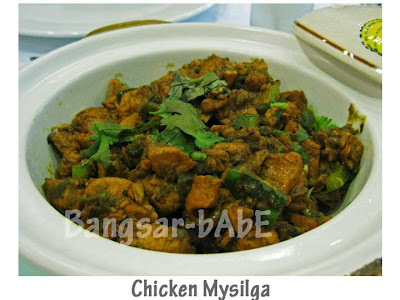 Originally from a countryside in Bombay, the Chicken Mysilga is fragrant and robust in flavour. Cooked with chopped bell pepper and mixed Indian spices, it fares well with everyone. I particularly enjoy the Gobi Chicken Varuval (a South Indian dish). Prepared with plenty of chopped onions, turmeric, chili powder, dried chilies, coriander and black pepper, the chicken pieces have a most intense and fiery flavour. So fiery it leaves the tongue tingling. The dish would be better with boneless chicken (Shum and I find the bones annoying). 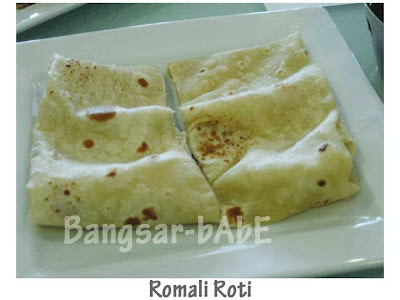 The Romali Roti is made from maida (white flour), and rolled into a rectangle. I find it similar to flour tortillas, but sweeter and thinner. Great for those who want something light. A big metal bowl covered with puffed-up bread is placed in front of me. 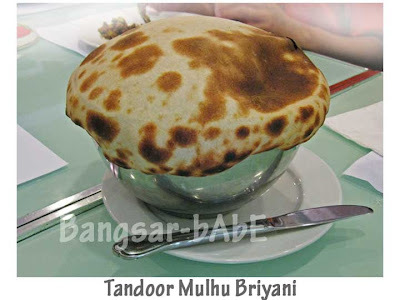 The waiter pulls the bread apart and reveals a most fragrant Briyani rice. 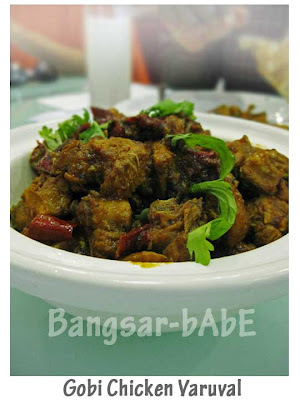 As we dig into the fluffy rice, we find a generous serving of tender, savoury mutton. Well-cooked, it has no gamey-ness often found in lamb or mutton. 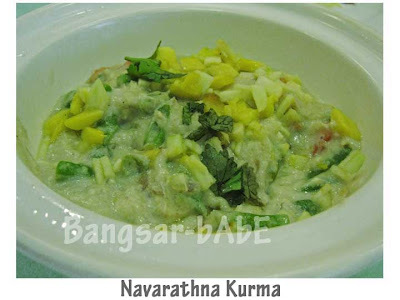 A North Indian dish, the Navarathna Kurma (9 gems) is a dish of nine key ingredients. A fusion of selected vegetables, pineapple, nuts and paneer cooked in creamy rich gravy, it is sweet and an acquired taste. 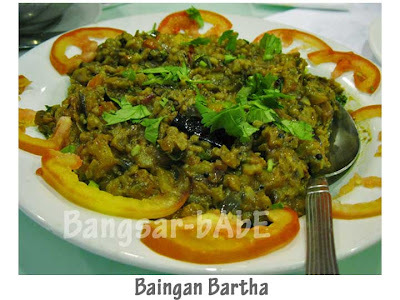 The Baingan Bartha (dry eggplant curry) is one of our favourite dishes. The eggplant is roasted till tender before being mashed. It is then sauteed with garlic, onions and tomatoes in hot ghee, and seasoned with mustard seeds, curry leaves, coriander and Indian spices. Sweet kesari and cups of bru coffee and masala tea end our meal. Creamy, lightly spiced, Bru Coffee is India’s equivalent to Nescafe. I love it. The Masala Tea however, didn’t tickle my tastebuds as I’m not used to having spice in my tea. I know you want to try it! omakase for indian food?? wow..that kinda cool..
but looks very rich and spicy man..so many dishes! joe – yeah, my boss is spontaneous. he loves little surprises, as much as he loves good food.